Safety Plus Australia aluminium and composite fibre walkway systems are lightweight, easy to install and maintenance free. They provide a designated safe path of travel for the user, whilst providing protection to roof sheet material from damaging foot traffic. 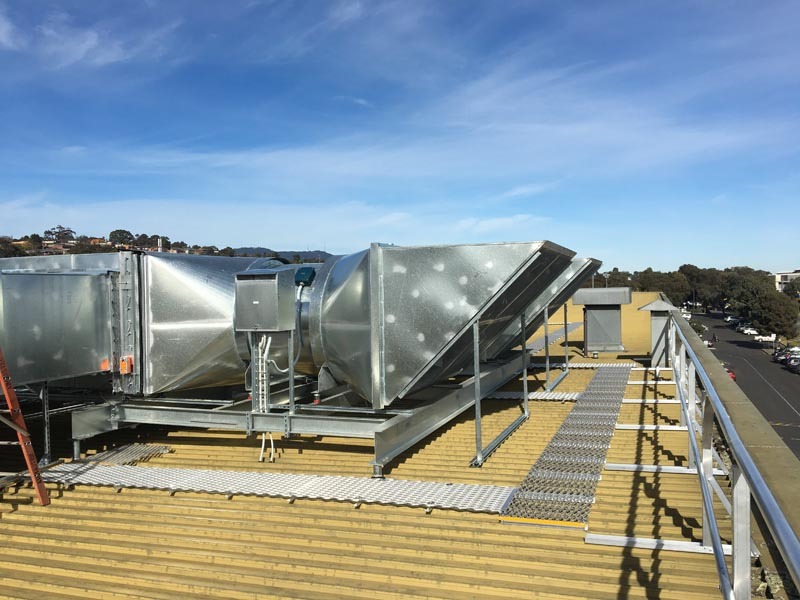 Safety Plus Australia can design and install a system to suit any roof surface and pitch and can mechanically assemble them on site. Our walkway systems are designed to meet the relevant requirements of AS/NZS 1657:2013 and various statutory codes of practice. If seeking additional information about any walkway system application, contact our expert technical team by emailing us at info@safetyplusaustralia.com.au or calling us on 1300 713 566. Walkway Systems can provide safe access to all types of flat roofs. They provide roof and fall protection for your staff and contractors. Safety Plus Australia can design and fit your flat roof requirements. Roof Access Walkway is a key component of any height safety system. Whilst not providing any form of fall protection, it does provide sure footing and a distinct path of travel for the user, whilst providing protection to roof sheet material from damaging foot traffic. 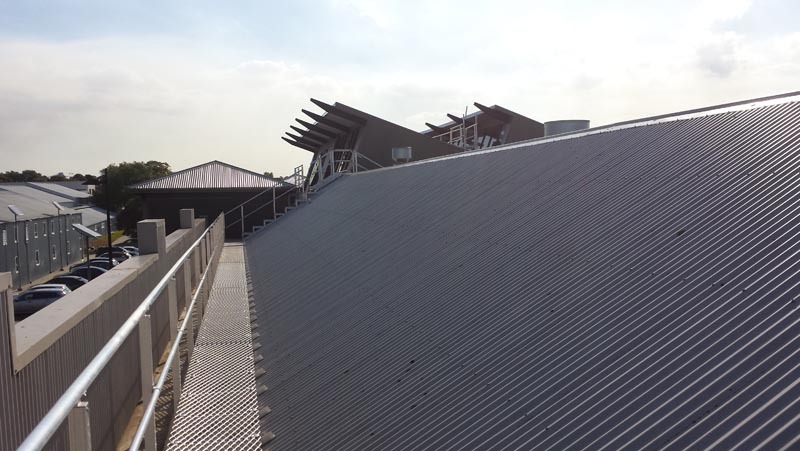 Roof walkway systems come in two main types: Aluminium and Fibre. Aluminium is a stronger alternative and widely regarded as the more superior product. Aluminium roof walkways will also be regularly found on plant deck due to its increased strength. Fibre walkways can be a lighter alternative for applications such as a membrane roof or mezzanine levels. 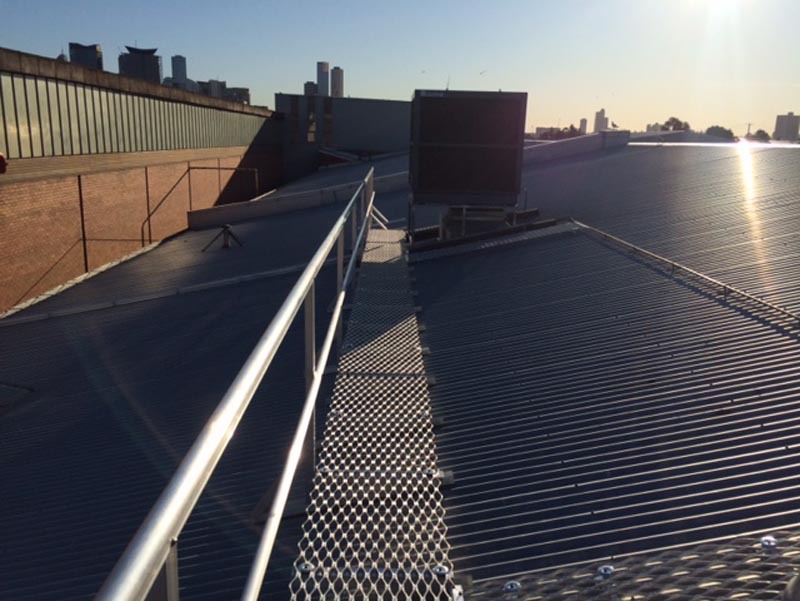 Safety Plus Australia is proud to provide both types of roof walkway systems – contact us today on (03) 9879 5230 to discuss our full range. It is essential that aluminium roof walkways be installed as per manufacturers’ specifications, as this will ensure their effective & long-lasting use. Aluminium roof walkways must be installed on a baton to raise it from the roof material and prevent galvanic corrosion caused by two different metals in contact with each other (i.e. Aluminium and Zinc). On a pitched roof, a pitch baton must be used to level your roof walkway systems. For additional info about galvanic corrosion and correction installation get in touch with our expert team by emailing us at info@safetyplusaustralia.com.au. Australian Standards should be referred to ensure when fall protection must be used in conjunction with the pitched roof walkway systems. Safety Plus Australia is here to help ensure you’re creating safe and efficient conditions. Whether you’re looking for roof walkway systems, roof access ladders, roof access systems, roof access hatch, roof platforms, roof anchor points, roof handrail systems, static line systems, flatpack products or more, turn to the Safety Plus catalogue for true safety and functionality.